Petra Boevink, Karl Oparka, Simon Santa Cruz, Barry Martin, Alan Betteridge, Chris Hawes (1998). 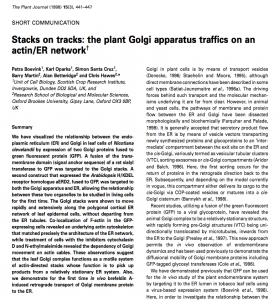 “Stacks on tracks: the plant Golgi apparatus travels on an actin/ER network”. Plant Journal 15(3): 441-447. In this study the researchers linked green fluorescent protein (GFP) to a Golgi address signal and used a virus as shuttle to transport this fusion protein into tobacco leaf cells. When they looked at the cells using a confocal laser scanning microscope, they discovered that plant Golgi bodies were not just sitting around in the cell doing their Golgi business, but that they were in fact whizzing around! Even more surprisingly, they were the first to observe that Golgi bodies were travelling along the endoplasmic reticulum network and the actin cytoskeleton – hence “stacks on tracks”. 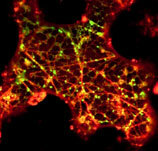 Golgi bodies on the actin network of a tobacco leaf epidermal cell. I am very happy that Petra agreed to answer my questionnaire and tell us about her current research. Petra now works at the James Hutton Institute in Invergowrie, Dundee and is studying the interaction between plants and plant pathogens. My main area is host-pathogen interactions, specifically the strategies Phytophthora infestans (the late blight pathogen; aptly named ‘the plant destroyer’) uses to overcome and subvert the plant defence systems. We have identified a particularly important class of proteins, called RXLR-effectors, that are secreted by Phytophthora species during infection and translocated into the host plant cells. There they interact with plant proteins, we think they particularly target those proteins involved in defence against pathogen attack, and change or disrupt their functions. We are trying to figure out what plant proteins they interact with and why and I am tackling these questions using cell biological techniques. The best things about where and how I work include the excitement of getting interesting results, working in a great team of people with different skills and backgrounds, I especially enjoy discussing and interpreting new results, creating beautiful images on the confocal microscope and presenting work at conferences. The worst things are the politics and the egos (yes, scientists do have all the human failings), the difficulties of getting funding and that the culture of science research still has not changed significantly, meaning that it is still extremely difficult to have family and a career in science. Throughout school and university I generally took the subjects that interested me. During university I found that I was particularly interested by pathogens of all forms. I made a conscious decision not to work on animal pathogens as I didn’t want to experiment with animals (I’m not against it I just didn’t want to do it). I did my PhD on a plant virus and from there my work stayed with plants, moving into the plant secretory pathway and subsequently other plant pathogens. 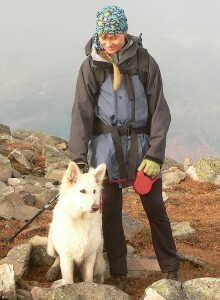 Walking, mountain biking, yoga, skiing and other active pursuits. I also have children who are great for keeping one grounded. Follow the things that really interest you. Be open-minded and give new and different areas/subjects a chance to grab your interest. Don’t be put off by things that seem hard to understand at first; it is a great feeling when you get your head around new concepts. Working in science can be really exciting and getting good results is a fantastic buzz but there are also times when things don’t work and you have to dig in and keep trying. Symptom of potato late blight. Taken by Fk. Date:August, 2000?. Place: Japan.